Sound the fangirl klaxon: Nigella Lawson is a bit of an idol of mine. I love reading her books and it feels a bit slack simply calling her a food writer – frankly, she’s the doyenne of modern food literature. As a child, my grandparents may have taught me the basics of cooking but my serious love of baking – and later cooking in general – was sparked sometime in my early 20s by Nigella. When young women were generally encouraged to seek pleasure anywhere other than in the kitchen, she made it feel not only okay to find absolute joy in food, to find solace and comfort in the heart of the home – she made it feel downright glamorous and desirable. Nigella is the best friend we all wish we had; but really she’s always there for us. Whether we’re whipping up pancakes for a family breakfast or staggering to the fridge with a hangover and a longing for leftovers, Nigella’s got our backs and a glint in her eye. 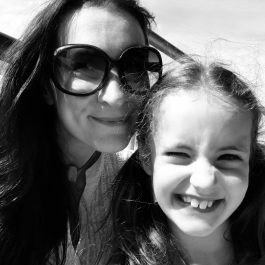 Through birthdays, Christmases, pregnancy and motherhood I have felt endlessly inspired, comforted and quietly empowered by her beautifully written words and recipes. As a vegetarian since the age of fifteen, I have enjoyed all of her books and read them from cover to cover, including the recipes I will never make. I’ve had no trouble converting a great many of her dishes (although anything involving a whole roast bird or a fish of any kind is beyond me!) but since progressing to a vegan diet just over year ago I’ve had to think a little more carefully, particularly where cakes are concerned. It’s been quite the journey and while a number of, ahem, experimental cakes have been flung straight into the bin, I’ve learnt a huge amount about vegan baking and it definitely gets easier as you start developing bit of a spidey-sense about what will work! 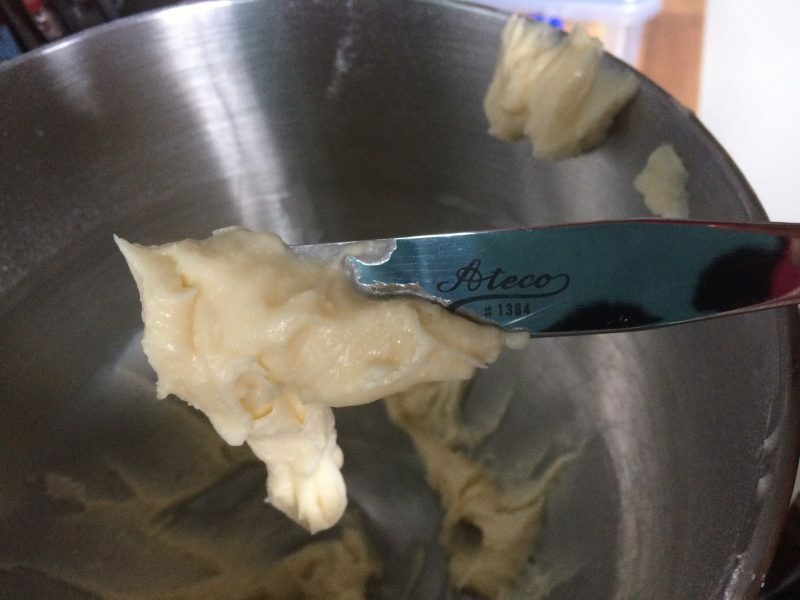 Butter is easily replaced by oil or Stork (try Earth Balance vegan butter in the US) and there are many things you can use as egg replacements – the key is to find out which replacement suits the recipe in question. 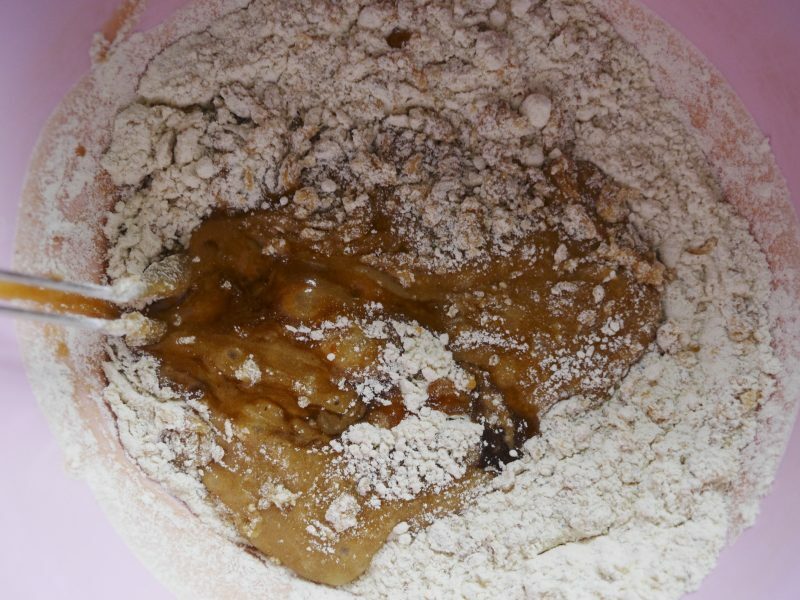 Also, the vegan method is quite different; when it comes to batters, including cakes, the best results generally involve mixing wet and dry ingredients separately then gently combining and getting it into the oven at lightning speed. (With no eggs to provide structure, the raising agents will wear off very quickly). 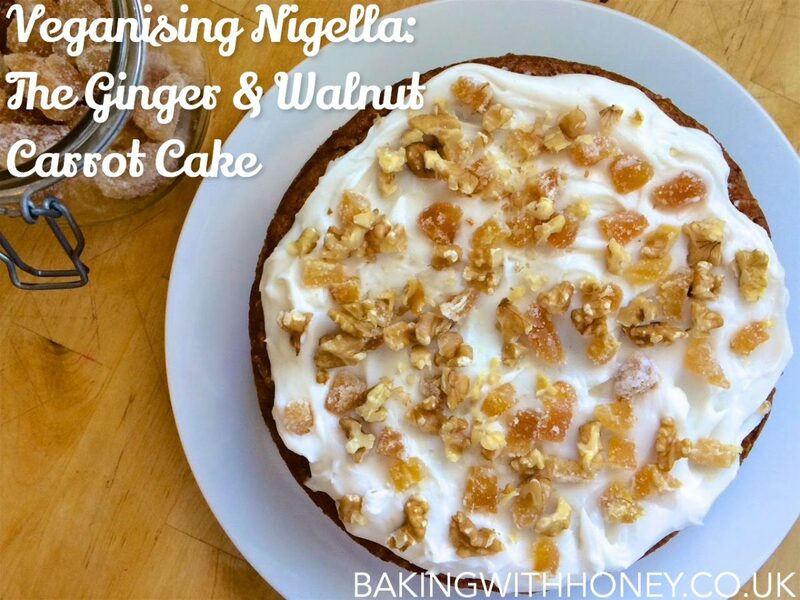 I absolutely relish the chance to ‘veganise’ any recipe that catches my eye, and couldn’t resist having a go at adapting Nigella’s Ginger & Walnut Carrot Cake from her latest book, At My Table. (The original recipe is also online at Nigella.com). 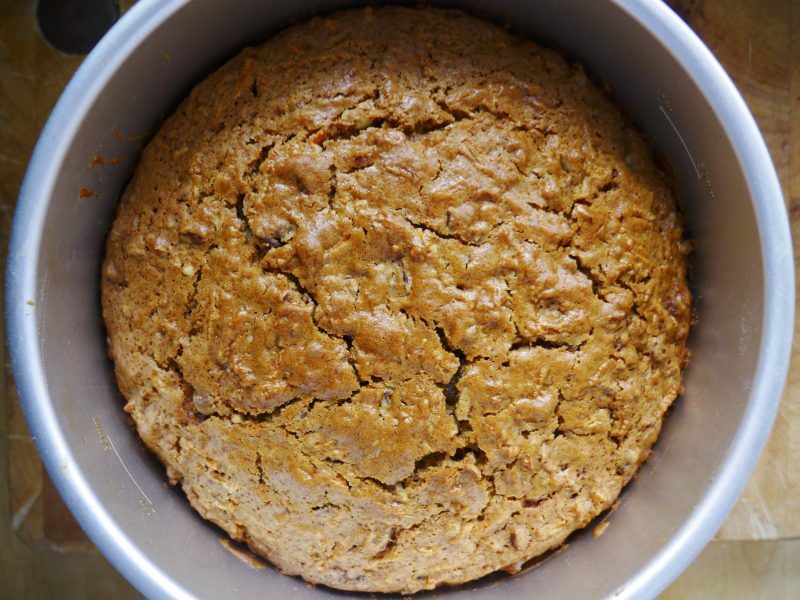 I tried a couple of simple tweaks and it turned out brilliantly – this is an outstanding carrot cake! However, I had no luck veganising Nigella’s accompanying cream cheese icing as it became a soupy, curdled mess – I strongly suspect it may have been due to a reaction between the vegan cream cheese and the grated ginger juice. As a result I returned to my favourite vegan cream cheese frosting, which is pretty stable as it uses a minimal amount of cream cheese anyway and I omitted the ginger juice. The cake provides such a punchy ginger flavour I don’t think it makes any difference. This is a delicious cake – a slice would be a good idea at any time of the day, but it’s also gorgeous enough as a birthday cake or to bring out after dinner. 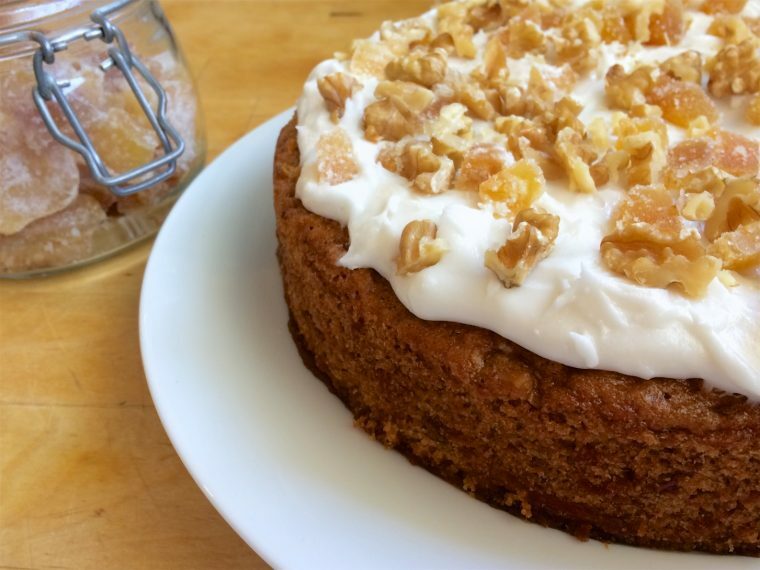 The spicy crystallised ginger is a fabulous twist on an old classic – it’s probably the best carrot cake I’ve ever had or made – vegan or otherwise! Thanks to the magic of social media, Nigella has generously shown interest in my vegan version of her cake, so here it is. I hope you’ll enjoy it. You will need a deep 20cm/8″ round cake tin, preferably a springform or one with a loose bottom. Oil/grease it and line the base. Before you start, make sure you’ve prepped your tin and the oven is preheated to 180c/350f/gas mark 4. The cake comes together really quickly and it needs to go straight into the oven. Grate the carrot and set aside. Chop up the crystallised ginger as finely as possible (this is really tricky as it’s so sticky!) and roughly chop the walnuts, or break them up with your hands. Stir together and set those aside too. 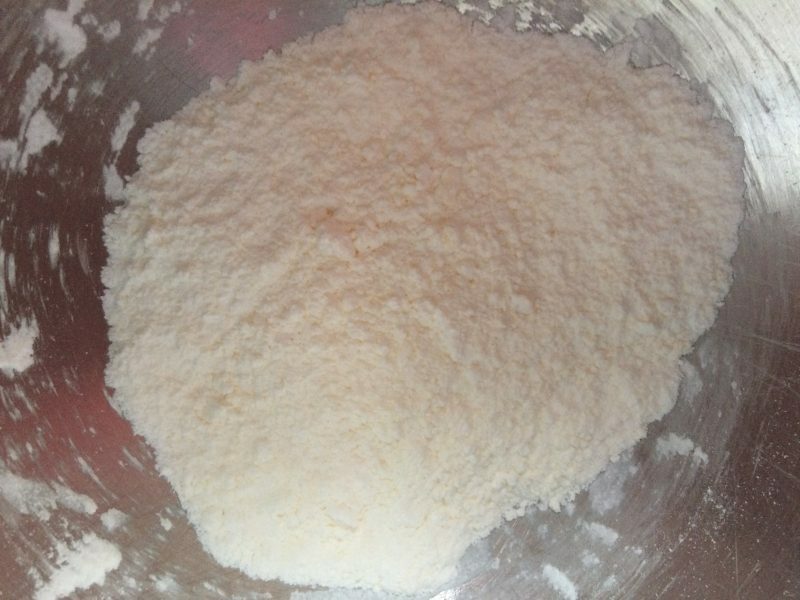 In a large mixing bowl, stir together the dry ingredients: the flour, baking powder, bicarbonate of soda, ground ginger, salt and sugar. In a separate jug, briefly whisk the oil and milk together then pour into the dry mixture. Use a spatula to quickly combine, scraping down the sides as you go, just until you can’t see any remaining dry bits. 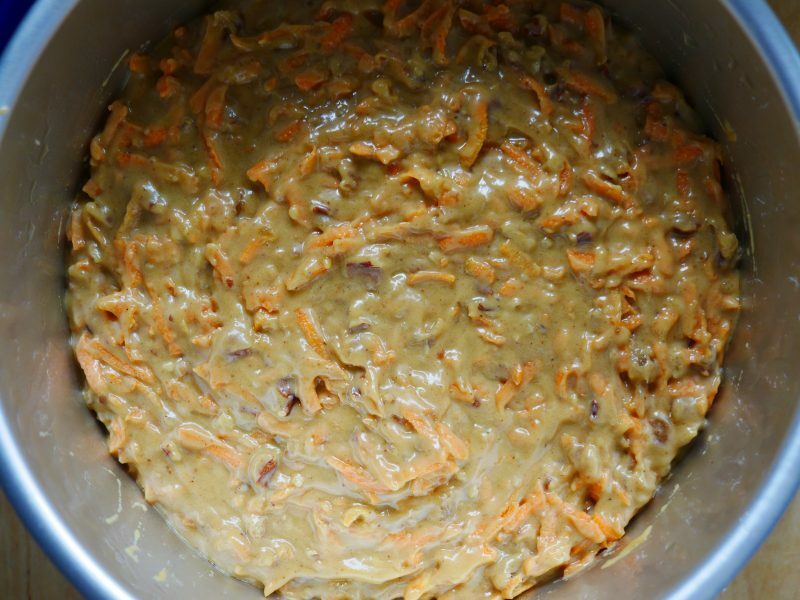 Then stir in the grated carrot until it looks about even, then lastly add the chopped nuts and ginger. Briefly combine then transfer the mixture to your prepared tin. Bake for 45-50 minutes or until a skewer comes out clean. This is a lovely moist cake so a few sticky crumbs are fine, but if you can see a bit of batter put it back in the oven for five minutes and test again. Don’t worry too much, remember it will carry on cooking for a bit as it cools in the tin. Put the tin on a wire rack and leave for at least 30 minutes before attempting to remove the cake. Leave to cool completely before putting the icing on top. 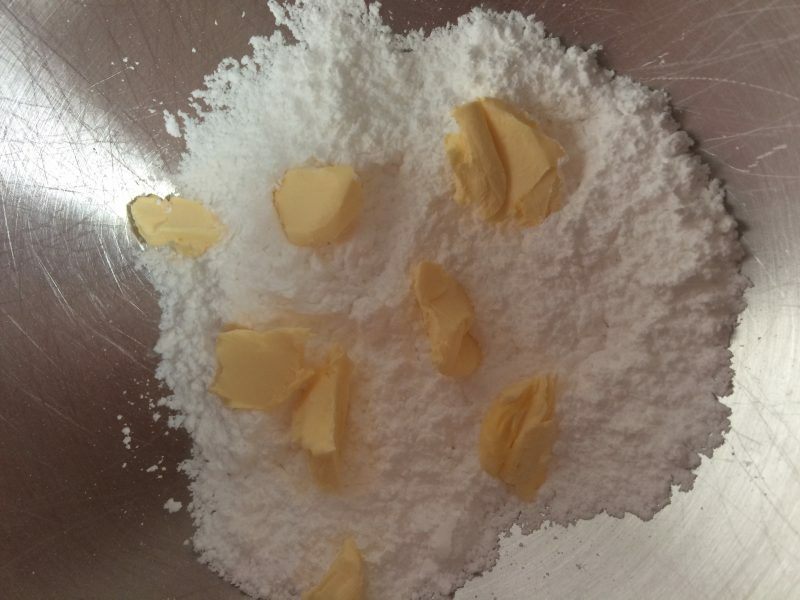 Place the icing sugar and butter in a mixer and mix slowly until the mixture looks sandy (if your vegan butter is room temperature the mixture may well start to look a bit creamy instead). 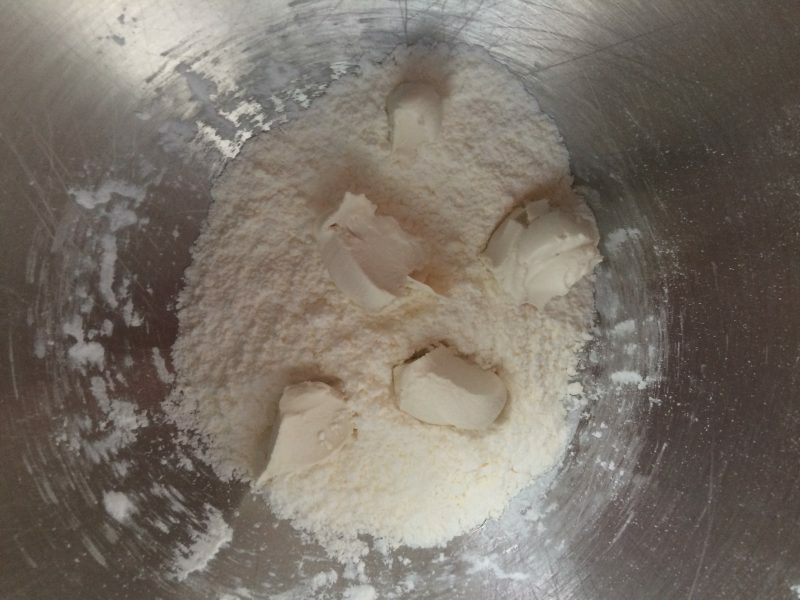 Add the cream cheese and continue to mix slowly just until frosting looks creamy. All cream cheese frostings are temperamental and this one is no different. If you switch up to a high speed for more than a few seconds it’s likely to split, so stop as soon as the icing looks reasonably creamy! Spread thickly over the top of the (stone cold) cake and scatter the chopped ginger and nuts. I’m always perplexed by the storage of cake covered in cream cheese icing. I suspect it would be alright at room temperature for a day or so, but I do tend to keep mine in the fridge and let it come to room temperature before serving. Notes: For the icing, I use Bute Island ‘Creamy Sheese’ original cream cheese spread which is easily found in Holland and Barrett. Bute Island also supply Tesco and Sainsbury’s (under their respective ‘free-from’ labels). If you can’t get hold of any, you could omit the icing entirely (this cake is perfectly moist and delicious without it) or consider making a really zesty lemon frosting instead of a cream cheese style. Lemon tastes amazing with carrot cake and would work particularly well with the ginger! (It won’t taste like a cold remedy, I promise). 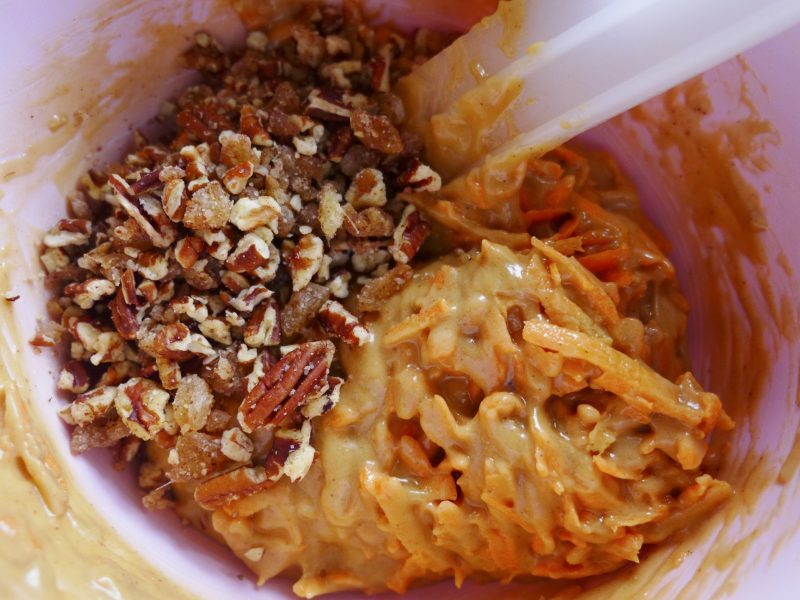 Also, if you prefer a more traditional carrot cake, you can simply omit the ginger (maybe swap for raisins) and you could even leave out the nuts if you wanted had to. Other than flavour, it’s not going to make much difference to the overall cake. Being a lacto-vegetarian (I eat dairy but not eggs) and somebody who loves to bake, I’m always on the lookout for great eggless cakes. When I saw your post on twitter to Nigella about your recipe, something just told me I needed to test it out as soon as possible. I handed this one over to my mom, she would do the baking and I would frost it. We baked it in a normal 20 cm cake tin without a removable bottom but greased it and lined just the bottom. It baked perfectly and turned out easily after cooling 30 min. I went with a non-vegan cream-cheese frosting. We had our first piece Sunday evening and it was delicious! Will definitely be making this again!!! Thanks so much for your lovely comment, I really appreciate the feedback! I’m glad the cake turned out so well for you. We love it too. Definitely one to make again and again. There will be more vegan cakes to come in the near future so please stop by again soon!